Large Resident Stripers The striper fishery on the Lower Sac below Red Bluff consists entirely of resident fish. These aren't migratory fish that come in for a couple months in the spring. These fish are in the river year-round and the months of June-September are prime-time. Big Flies for Big Fish The volume of baitfish in the river is pretty staggering. Most of the flies we use are in the 2/0 size range, but they can be much larger or smaller depending on the predominant forage fish at the time. How Big is Big? The sky is the limit. I've seen 40# swim under the boat and local fly anglers have landed fish over 50#. Most days we see fish in the 20# class chase our flies. While we don't always hook into these larger fish, on a typical day we hook a couple dozen schoolies in the 12-18" range. Warmwater Fishing Paradise The Sacramento River below Red Bluff has endless warmwater fish habitat. There are largemouth and smallmouth bass, shad, and carp to test your fly fishing skills. We can tailor each trip to your interests. Sacramento River Smallmouth We catch smallmouth incidentally while striper fishing, but it's also possible to target these gamefish. They put up a great fight. Shad on the Lower Sac The shad run is huge on the Sacramento River and lately the shad have been going all the way up past Red Bluff. We frequently spend a couple hours chasing shad at the end of our striper fishing day. A prolific striper fishery lies just downstream from the prolific wild trout fishery on the Lower Sac. Once you get downstream from Red Bluff, every bend of the river offers a chance at the striped bass of a lifetime. 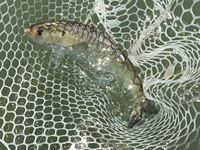 There are great numbers of small fish from 12-18" and surprising numbers of fish in the 10-20 pound class. Prime time for this fishery is June through September. Warm October days can be good, too. We use jet boats on this exciting warmwater fishery. Our jet boats are equipped with trolling motors, casting decks, stripping baskets, and bimini tops for escaping the intense summer heat. Today was my second day fishing Dave from SoCal and we opted for a striper trip on the Lower Lower Sac. Fishing was challenging with high winds all day, but Dave managed to land his first striper ever right off the bat. No big fish today, but we had some action on schoolies and a few pikeminnows. With all the wind I had to use my A (anchor) button on my Minn Kota remote control a lot today! Did some scouting with Brian Kohlman yesterday and found some shad in the Red Bluff area. Not many, but they were good size, in the 2# range. No sign of stripers near Red Bluff yet. I have been striper fishing the last two weeks and it has been less than spectacular. Last week was very slow and this week has been a little better, but there have been very few hookups on larger fish. The last two days we saw decent numbers of schoolies and a few good-sized largemouth up to 3 pounds. We briefly hooked one striper about 5 pounds today. The best fish hooked this week was in the 8 pound range. Stay tuned for more striper reports. There are a moderate number of salmon boats out around Corning and Chico and I witnessed 3 salmon hook-ups in the last couple days. For more Lower Sac Stripers dates, please visit our Online Booking page! Rods, Reels & Lines: Eight and Nine weight rods are best. We typically have two rods rigged at all times, one with an intermediate sink-tip and another with a fast-sinking sink-tip. Terminal Tackle: Maxima tippet in 12-15# is all you need. Attire: It is usually hot or very hot when we're fishing for stripers. Make sure to cover up to protect yourself from the sun. We recommend lightweight pants, Simms SolarFlex shirts, and Buff headgear. Bring comfortable water shoes that won't tangle too much with your fly line. Meeting Time & Place: We typically meet our clients at their hotel or at the boat ramp at 8:30am. Vehicle Considerations: We typically have our clients ride with us in our vehicles if we meet at your hotel. Wading difficulty: All striper fishing on our Lower Sac trips is done from the jet boat. No waders are necessary. Multiple Fisheries in one Day: We devote a whole day to this fishery. Plan to stay in Red Bluff or Corning.